As a little girl, Rose didn’t have the best start in life with an alcoholic father and a mother suffering from depression. By the age of nine, Rose’s father had walked out on the family and her mother was sinking deeper into severe depression, reversing the mother/daughter relationship as she depended on young Rose for care. By the age of 17, Rose was alone in the world. She wanted nothing more than to be loved and taken care of, part of the family unit she had always craved so when she met Richard shortly before her 18th birthday, Rose finally felt happy. By the age of 31, Rose is running away from her life, taking her seven year old daughter away from everything and everyone they know, including her husband, Richard. Rose turns up at a Bed and Breakfast in Millthwaite, a town depicted on a postcard Rose received years earlier and kept close to her heart. Despite the late hour, the B&B’s owners take Rose and Maddie in but Rose knows it’s only a matter of time before her old life catches up with her. 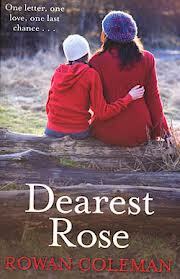 Dearest Rose is a deeply moving tale, from Rose’s inadequate childhood to her disturbing marriage and her awkward daughter, Maddie. Rose has always tried to keep her problems from her daughter but her relationship with Richard has obviously taken its toll on their child. I felt for Maddie, whose bluntness often alienates her from other children, but I was glad when she started to form new bonds with people in Millthwaite. Rose has lived such a difficult life, jumping from one heart breaking moment to the next so Dearest Rose is an emotional read but also gripping, keeping you turning the pages to find out what will happen next and whether Rose will finally find her happy ending. The book is full of big characters, from little Maddie to B&B owner Jenny, artist John Jacobs and Rose’s best friend, Shona. Shona was probably my favourite character. She was so complex; on the surface she was loud and brash, often vulgar while inside she was just as troubled as Rose. I also really liked Jenny, despite her coldness at the beginning. She soon thawed and I liked how strong and loyal she was. Dearest Rose is a fantastic read with characters I truly cared for and I enjoyed reading it immensely, despite the near-constant ache in my chest as the extent of Rose’s life unfolded. Rose is a strong woman, even if she doesn’t always believe it, and I willed her on the whole way, wanting her to break free from her past and build a new, happy life for herself and Maddie.